The Sable is one of the most striking crias born on the farm in 2006. He has the prototype head that is common of Neruda (El Vasco's sire) descendants. He is a well balanced boy with ample fiber coverage. His fleece is very fine and soft. He has both black and grey bloodlines and we are starting to see some graying of his fleece. Both his dam and sire are champions in the showring. 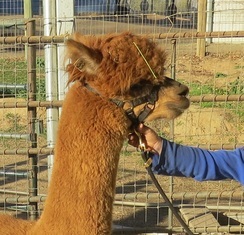 His dam, Adriana was on our showstring in 2003 (Reserve Champion AOBA Nationals, Reserve Champion AWE 2003, 1st Alpacapalooza). His sire, El Vasco is an extremely fine-fleeced Neruda son who was on our showstring in 2004 (Champion IAO, Reserve Champion NAAS, 1st AWE, 1st MAPACA). El Vasco is one of the most fine and most dense (according to follicle testing) herdsires on our farm. This Beautiful girl has the sweetest disposition and is a joy to have on the ranch. Her dam is an easy breeder and excellent mother. 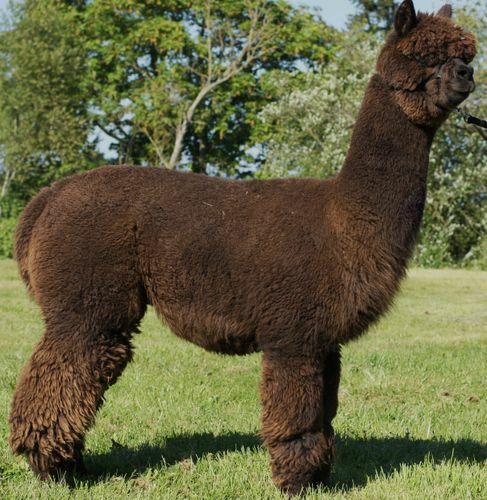 Colette's sire is none other than Patagonia's Darwin, a true black herdsire with incredible character in his fleece, terrific bone, passing on beautiful topknots, conformation, perfect bite, and sweet disposition to his progeny. Darwin is out of Patagonia's Danko who needs no introductions.